As we grow up, we realize that life isn’t easy and that there are many people indeed who would not like to see us succeed in what we do. Negative thoughts and constant criticism might tear us down. In our life we need some words of encouragement and inspiration to help us along our way so that we do not lose hope and understand that each failure which we encounter will be a tremendous learning experience for us. 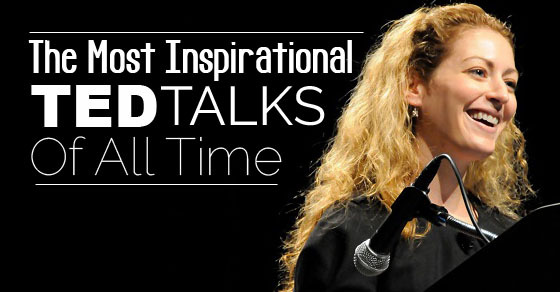 Enlisted here are some of the most inspirational and best ted talks of all time that are bound to lift your spirits. The following mentioned are few best ted talks videos which are very motivational and must for all. As most of us grow older, not only do we start turning more and more pessimistic but we also stop living life in a passionate and fun manner. Simply going through the motions in life, is something that is not desirable and it is this way of life that will always leave you with an incredible emptiness and void. Isabel Allende stresses on how it is your choice whether or not you would like to live your life passionately and that the more open you are to new experiences the broader will your way of thinking to be. It is important always to live each day to the fullest. It is all but natural, that those individuals who have some physical disability are naturally going to think themselves to be at a disadvantage as opposed to those people who are fit and able. Yet Ron McCallum is one such inspiration, he has been blind for over the long period of six decades talks about how he has never given up hope, rather he has used modern technology to help him along his way. Though his words would touch the visually impaired the most, yet he serves as an inspiration for everyone who takes things for granted. Dan Pinks words are truly not merely inspiring but rather they are also helpful to make us realize that a number of things which we take for granted and believe to be true are not so. Pink majorly breaks down all the popular motivation related fads. In his TED motivational Talk he speaks in detail about the science behind the working of motivation and that the traditional incentives aren’t always as foolproof or effective as we have perceived them to be. He even goes as far to say that the incentive design which we believe to be very effective is absolutely not instrumental in sparking our creativity in any way at all. One of the most effective manner for anyone to get their point across is by making use of concrete examples. For example, Parables have been a medium of expounding knowledge since ancient times where even Jesus Christ made use of parables to explicate his point and to drive the facts home to the disciples. Simon Sinek is someone who shares the patterns and success stories of great leaders across the world so that their story may be able to inspire others who look up to them and desire to follow in the footsteps of these individuals who serve as role models to a wide spectrum of people. Not many people realize that the manner in which we conduct ourselves and our general bearing has a great deal to do with the way in which other people conceive their image of us . What Amy Cuddy does is tells us categorically the ways in which we can use our body language in order to shape the way our lives will unfold. So listening to what she has to say is bound to be interesting. Various individuals say that success is something that can be achieved only by those individuals who have a very high IQ. Yet, what Angela Lee Duckworth, says that your IQ has little or no bearing when it comes to whether or not you will be successful in your professional and personal life. She explicates how passion, as well as perseverance, is indeed very important in your journey through life. When you are passionate about what you do then your job will not seem like a burden to you, rather you will enjoy you work and will constantly come up with new ideas. Jane Gonigal’s is rather unconventional indeed, where she talks about how playing games has a number of benefits, not merely on our physical health but also on our mental health. Playing games helps to boost our resilience and it helps us to be goal oriented. In addition to this it also teaches us to be focused so that we do not stay along in the path of life, doing things which are unnecessary and which will not help us positively in any way at all. Finally, you may not believe but she also states how it helps in furthering our lifespan. 9. David Pogue shares 10 simple as well as clever time-saving tips for computer, web, Smartphone and camera users. It is absolutely needless to say that nowadays, time is of the essence and time means money. Since it has been deemed the most valuable resource of our times, David Pogue gives us some important hacks which will help us make use of technology more efficiently so that we can get our tasks and works done in a faster manner. Once we are able to get our jobs done faster then we can focus on other things in life and even spend some quality time with family members. We should control technology and not let technology control us. 10. Alexander Tsiaras shares a powerful visualization of the human development. Our mind responds much better to visuals than it does to words. This having been said, Alexander Tsiaras’s inspirational TED talk is indeed a powerful visual representation on the theme of the development of a human being from the time of conception. This moving visualization is bound to fill you with a great sense of wonder and will really help you to understand what is really important in your life. Sometimes even a picture or a video has the ability to really move one and to help them to gain a novel and fresh perspective on life. It is one of the most inspiring and most viewed ted talks of all times. Keith Barry tells us how the mind can easily be influenced by magic. It is needless to say that the brain is an organ which serves as the centre of our nervous system and it controls the various organs of the body, however Barry has that our brain is so powerful that it can even fool our bodies and trick it in order to believe something or to even handle some pain or pressure in a particular way. Watching the talk will indeed be helpful as it will help you to have a ‘mind over matter’ approach to any problem which might come your way. Shawn Achor explicates on how positivity and a happy frame of mind can indeed yield marvellous results in terms of the quality of work. His talk is indeed a hilarious one which is bound to leave you with a smile on your face as it encourages you to have a positive outlook on life and always be optimistic in your approach. When you are constantly being negative and pessimistic then you are doing nothing but holding yourself back and this will eventually take a negative toll on the quality of work which you submit. It is unfortunate but true, that very often in life many of us are taken for a ride by people who are cheats as well as swindlers. Pamela Meyer in her talk, gives us very useful hacks to help us spot a liar. Honesty is a quality which is incredibly hard to find and you should always ensure that you do not place your trust and faith in the wrong hands or you might end up having regrets in the future. So even if you have one or two honest friends it is better than having a number of people who you cannot trust and who will not hesitate to lie to your face when being asked even a simple question. Elizabeth Gilbert stresses on the fact that all of us have the ability to be a genius. Each of us is a genius in our own individual way and being a genius isn’t quite so rare or uncommon. Listening to this best ted talk is bound to help you boost your own confidence and help you realize that in life the only thing that will help you to get ahead is having faith in yourself. If you start second-guessing your own genius ability then you cannot possibly expect anyone else to place their trust in you or to even invest their time and money in someone like you. Each and every one of us has our own talents as well as abilities. There are primarily two kinds of individuals, the introverts as well as the extroverts. Susan Cain in her talk, speaks about how in life it is the introverts that bring exceptional talent as well as the ability to the world and what they bring to the world should be greatly celebrated as well as appreciated. Though extroverts are the people that are usually stealing all the limelight, Cain stresses on what these quiet and reserved individuals bring to the society. This talk is indeed both different and one of a kind, giving people something to think about. After viewing these best of TED talks, you are bound to feel better about yourself and you will seek the much-needed motivation to help you along your way and to achieve big things in your life. Contrary to what many people might think, TED talks motivation are most certainly not boring or dull, rather there are a number of different kinds of TED inspirational talks, all which achieve different purposes by evoking different emotions within us. Here are some motivational TED talks that will make you laugh, others that will make you cry but you can ensure that all of them will teach you something and help you in this journey called life.